The Synchro EXC700iP was designed to deliver an impact-free total body workout. 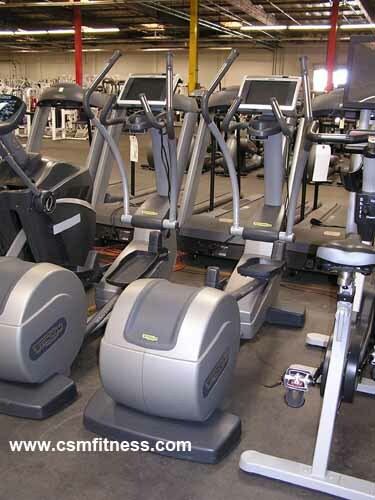 It is the first elliptical to incorporate Fast Track Controls, which enables users to adjust their resistance directly through the movement of its arms. Its double handlebar design includes heart rate sensors on both the handle bars and arms to ensure constant heart rate monitoring. Technogym integrated a high definition LCD touch-screen that provides users with various entertainment options. These options include an iPod and USB connect, an internet connection, live TV and radio, and a Wellness System Key. Its Wellness System technology allows users to create customized workouts and save their data onto a computerized key. Additionally, its motion belt transmission system ensures a smooth and quiet workout session each time. With 25 levels of intensity and 13 various languages, the Synchro EXC700iP was built to accommodate a variety of users while also keeping them entertained.